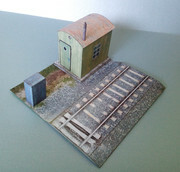 On our site I added free model of typical railway auxiliary building called in german: Wellblechbude. It is kind of small shed used as warehouse or post. Model is made in 1:45 scale and it is for free. Thank you, there is a lot of interesting train and model stuff via the main page. If rescaled the engine would look good on the tracks in front of the shed (the shed is 1/35, the engine is 1/87 so the conversion number is 2.48571...). 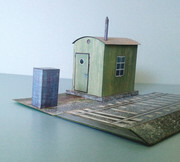 Thanks again for the links to your web site kartonowakolej.pl and the paper model. Last edited by John Wagenseil; 09-14-2018 at 11:26 AM.